Heather Harde, senior vice president of mergers and acquisitions at Fox Interactive Media is all set to join as the new chief executive officer at TechCrunch, a technology blog edited and published by Michael Arrington. Arrington could not be reached for a comment. We left him a voice mail and tried to contact him via email as well. We are still trying to were able to confirm this information with FIM., but there is little chance we can get this information before the start of the new week. Harde was one of the early hires by Ross Levinsohn, former president of FIM. Harde, worked on many deals for FIM including the acquisitions of Newroo and kSolo. A frequent guest at some of the earlier TechCrunch parties, Harde is quite familiar with the Silicon Valley landscape and spent a considerable amount of time in Northern California. As someone who is trying to balance editorial tasks with chief janitorial duties that go with the title of a founder, Harde’s presence will help Arrington focus most of his energies on editorial. 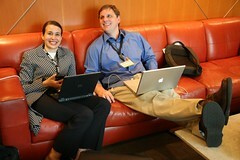 Photo: Harde and Arrington, sharing a laugh at Gnomedex; copyright: Laughing Squid/Scott Beale, hosted by Flickr. they might just want to gobble you up as well. Since Heather is experienced with M&A, is an acquisition of GigaOm (for the right price of course) a possibility as Matt mentioned? From a reader’s perspective, you both seem to be friendly rivals covering the same goods. Also whats up with these links within the comments?? Its like spam. Please Om, have these removed…really annoying. Does this take blog out of TC? I’ve met Heather; and Michael’s made a wise and prescient move here. She’s a sharp and experienced lady…just one more example that blogging really is growing up to become an important; if not universally liked and/or accepted; player in the media world. …now, as for your back, for many; though it may seem counterintuitive as many doctors and health practitioners still recommend “rest” and heat; ice packs placed over the painful area/s (with a t-shirt or other thin material to prevent ice burn) with slow walking is often successful. This is especially effective for lower back pain/spasms/tightness. If Tello is a sample of things to come, having experienced, savvy dealmakers on board will be a good counter-cyclical move on Mike’s part. This is a smart move. I think this will probably free Mike up to expand on the empire, and I wouldn’t be suprised to see some new products and offerings from TC. There seems to be a lot of Fox bashing here, but the fact is that FIM is actually pretty damn good at what they do. They arguably got a steal of a deal for MySpace, and Newroo will be the basis for an actually decent MySpace news product. Good for TC! Smart move, wont mind selling mediarati.com, veetube.com. or bazaah.com for the right price to them. Read the post again. She’s from FOX INTERACTIVE MEDIA, not FOX TV or FOX NEWS. Fox Interactive Media = the people who own MySpace. It must be tempting, in the new world of media, to rely on broadcast executives. In one way, they’re experienced. Unfortunatly, they’re experienced in the wrong things — particularly someone from FOX. Oh, Om, some cheap things are good and fun. Posting @ 10:00PM on a Saturday night? Get a life. Time to go clubbing…. I bet nothing that is good is cheap, and I for one am happy to see that someone like heather is taking on a new role. it makes perfect sense to get someone from the big media side of things to the emergent platforms, aka blogging. you are right… he is doing his thing. For now, I am going to see how long I wear the two hats and make it all work. But in the long run, all growing concerns need outside help, and a seasoned and innovative chief executive can do wonders for the little start-ups. Interesting. I just don’t know why he would need a CEO, but I guess he is the top dog, right? Top dogs are always usually innovating. Looks like Mike is building out his business and is bringing in much needed help. I would say this is first step towards turning TC into a full fledged publishing business. On the Web 2.0 madness, well that is a topic of another post and I might be in full sync with you on that. CEO of a ‘blog’?? WTF? This web 2.0 madness is beginning to take full hold of people. I think he should be hiring writers. Oh, that’s right, he tried that. Newroo and kSolo acquisitions…quick, tell me those are sponge-worthy, please!?!? Can someone verify if this is same chick who worked at News America Marketing on retail coupons? Very interesting. Can’t help but wonder if the hiring of an M&A specialist as CEO won’t lead to some significant expansion for the popular tech brand. So does this mean that TechCrunch will be “Fair and Balanced” in typical Fox style?